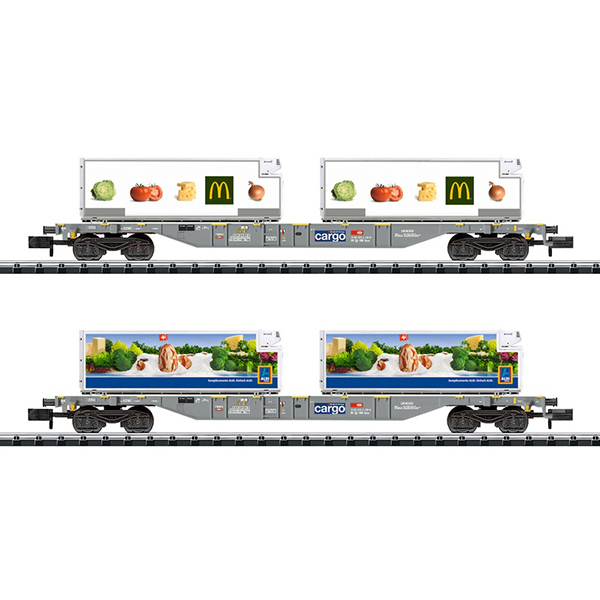 Prototype: Two (2) type Sgns container transport cars loaded with refrigerated containers for the fast food chain McDonald's and the grocery chain Aldi, used on the Swiss Federal Railways (SBB/CFF/FFS). The cars and containers look as they did in 2017. Model: The cars have die-cast metal frames and close coupler mechanisms. They are each loaded with two (2) refrigerated containers. Total length over the buffers 246 mm / 9-11/16".